Designed by C.F.Møller. 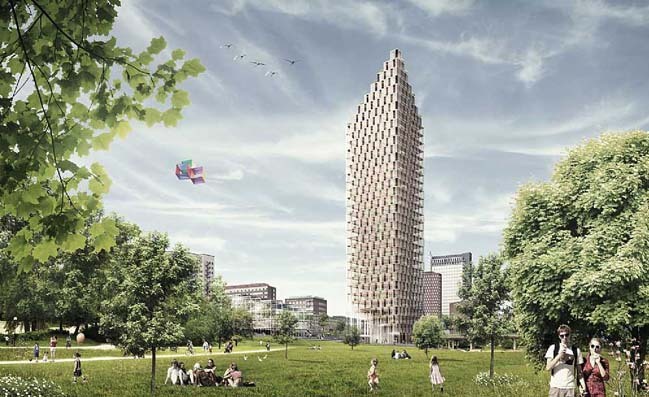 Västerbroplan is a sustainable apartment building in Stockholm, Sweden with an amazing wooden high-rise architecture. 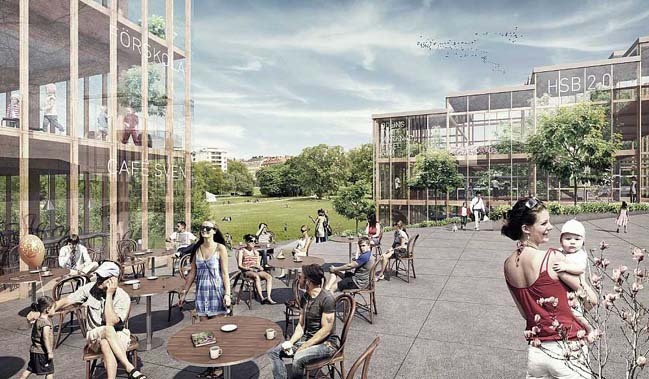 The project was got 1st prize in HSB Stockholm architectural competition in 2013. From the architects: For the Västerbroplan plot in the Marieberg district, Berg | C.F. 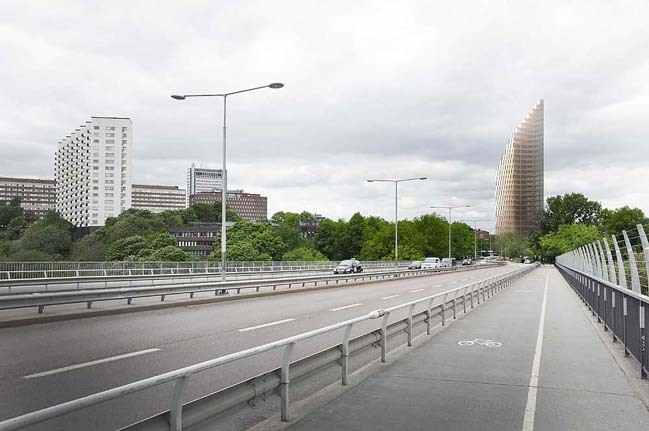 Møller in collaboration with Dinell Johansson has drawn up plans for a 34-floor wooden apartment building. The building is designed around a wooden structure with stabilising concrete cores and will act as a new characteristic landmark and meeting place in the city. 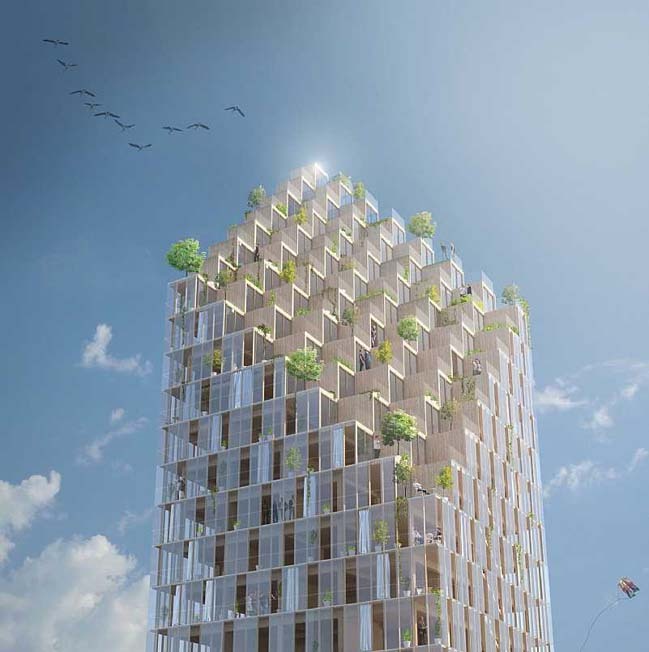 Pillars and beams will be constructed using solid wood and inside the apartments all windows, ceilings and window frames will be made from wood, allowing the material to also be visible from the outside through the large windows. Wood is the natural choice when it comes to materials for innovative residential development: It is an environmentally friendly and durable material which creates a comfortable and healthy indoor climate and you might be surprised to learn that the wooden structure also constitutes a very efficient protection against fire. Both social and environmental sustainability have been considered as part of this project: each apartment will be equipped with an energy-efficient glass-fronted balcony and the building itself will receive energy from solar panels situated on the roof. At street level there will be a café and a nursery and, in a new neighbourhood building, all residents in the area will be able to enjoy a marketplace, gym and bicycle storage location. A shared winter garden will make allotments possible.